$50 Million Australian Powerball Jackpot - Largest Ever! $50 Million Australian Powerball Jackpot – Largest Ever! The Australian Powerball jackpot once more went unclaimed which now means there is a very nice jackpot of $50 million dollars this Thursday – the largest ever jackpot for an Australian lottery. So are we about to see the richest ever Australian lottery winner? The highly popular Australian Powerball game was made to pay out very big prizes – and very big jackpot winners. Previously, the largest ever lottery wins have been more than $30 million only 4 times. And that’s since the game launched back in 1996, making the draw this week a very special event for all Australians. Who were the other big winners? Three of those huge jackpots were winners from the Powerball game, with one each from Western Australia, Victoria and New South Wales. Oz Lotto provided the fourth biggest win. 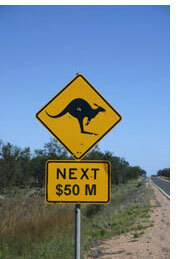 Oz Lotto has also created the biggest ever Australian lottery prize to date. And it happened just a few weeks ago. A very nice 1st division prize of $47 Million was claimed on 29 April 2008. It was shared by just 2 winning tickets, both bought in Sydney’s western suburbs. One was by a young man who claimed $24 Million, the other a syndicate of laboratory workers – who after sharing out the prize money still got $1.5 Million each to celebrate with. If you want to join the fun for this historical draw there is an Australian Powerball syndicate you can join online. It’s open to players all over the world, so a great choice if you can’t get a ticket because you don’t live in Australia! And as a syndicate it goes without saying that you also get a better chance of winning too – particularly important if you want to play powerball draws which are tougher to win to start with. That great big jackpot turned out to be $58 million dollars in the end. And it was won by somebody who bought a ticket from the Lakeside Newsagency in Reservoir (Melbourne). If that was you, get your skates on – apparently no winner has come forward to claim the enormous jackpot yet!